Bacardi has teamed up with Gebr. Heinemann to present Single Cane Estate Rums, a travel retail-exclusive collection. The premium, aged rums from estates across the Americas are available only at Heinemann locations. Each rum is crafted at its source in small batches for a unique expression designed to represent the character of its home. The collection’s initial two variants are sourced from Worthy Park Estate in Jamaica and Consuelo Estate in Dominican Republic. The sleek, contemporary bottle design is embossed with lettering in the glass and comes with a gift box detailing the latitude and longitude of the estates where the cane is grown, processed and distilled. 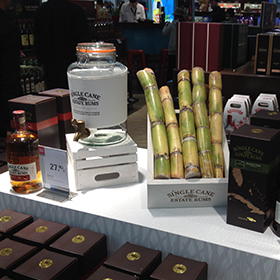 The first Single Cane Estate Rums activation is live now at the retailer’s Copenhagen and Frankfurt airport stores. The collections are introduced through in-store multi-sensory presentations. These feature Kilner-style jars of Caribbean spices which shoppers are invited to smell. Each contains a key tasting note, for example cedar, tobacco, cocoa and honey. Brand ambassadors complete the experience by offering signature serves of each rum. “We’ve had a tremendous reaction from shoppers to the excitement that Single Cane Estate Rums are bringing to the category, particularly through the appeal of the new rum drinking occasion of ‘single malt’ style sipping,” said Aude Rocourt, regional director Europe, Bacardi Global Travel Retail. “By crafting each rum entirely at a single source in small batches, each expression is unique and fully captures the unique character of its home – qualities of craftsmanship, authenticity and location that rum lovers are absolutely delighted to discover. Rüdiger Stelkens, purchase director LTC, Gebr Heinemann, added: “We are delighted to partner with Bacardi Global Travel Retail in creating these exclusive multi-location, in-store presentations of Single Cane Estate Rums. In addition to the inaugural activity at Frankfurt and Copenhagen, Heinemann will roll out the Single Cane Estate Rums experience at Hamburg, Berlin, Vienna, Oslo, Istanbul and others.